UC Davis Health’s new leader is a veteran of top administrative and academic leadership roles at major health systems — and a noted agent of integration and change in the reform era. This spring UC Davis Chancellor Gary S. May appointed David Lubarsky as chief executive officer of UC Davis Health and vice chancellor of Human Health Sciences at UC Davis. Lubarsky takes over the health system’s top leadership position from Tom Nesbitt, after Nesbitt’s second period of service in the interim vice chancellor position. Before joining UC Davis, Lubarsky served in a series of senior executive roles at the University of Miami Health System (UHealth), most recently for six years as chief medical officer and systems integration officer. In that position, he championed standardization and provided oversight for four hospital and practice chief medical officers, the chief medical risk officer, chief patient safety and quality officer, and the director of patient and visitor services. Lubarsky previously served as the first CEO of Miami’s 1,100-physician practice. Ultimately, I believe that everything we do should be about bringing greater health to the people that we serve. You can’t create a culture of caring if it doesn’t exist already, and there’s already an incredible one here. Simultaneous to those administrative roles, Lubarsky continued his role as Miami’s longtime chair of anesthesiology and perioperative medicine, where he led the world’s largest anesthesia training program and served as chief of service for the nation’s largest safety net hospital, Jackson Memorial. Lubarsky himself is one of the nation’s top 100 published practicing anesthesiologists, noted for his contributions to health economics, informatics and operating room management. Lubarsky’s wide-ranging experience also includes roles as a professor at the University of Miami’s business and nursing schools, and as part of a group that developed M.D.-M.B.A. and CRNA programs. Here he shares thoughts about his goals for UC Davis Health, the future of academic medicine, and the importance of embracing change. 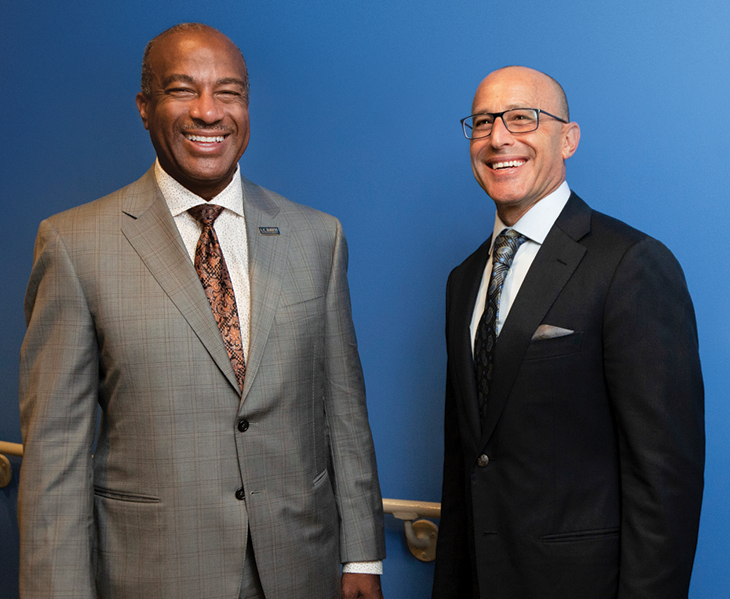 David Lubarsky (right), the new chief executive officer of UC Davis Health, with UC Davis Chancellor Gary S. May after Lubarsky’s arrival this summer. Q. What attracted you to UC Davis Health? UC Davis Health is a nationally ranked leader in health education, research and patient care. It’s well-positioned to become a next-generation health care enterprise. Our medical center is one of the top five hospitals in California and the top hospital in the Sacramento region, according to U.S. News & World Report. Our School of Medicine is now one of the ten best in the nation for primary care training, and our relatively young Betty Irene Moore School of Nursing is top-50 and quickly rising in the national ranks. Last year the School of Medicine ranked in the top 20 percent of institutions in the country — 26th in the nation — for research funding from the National Institutes of Health. Our NIH research funding has grown from $41 million at the millennium to $176 million in 2017. Besides this, UC Davis also has a longstanding reputation as having a very strong commitment to the community it serves. That’s a big part of what brought me to Sacramento — the opportunity to lead an organization that truly makes a difference in the lives of patients and in this community, by putting patients first. Ultimately, I believe that everything we do should be about bringing greater health to the people that we serve. You can’t create a culture of caring if it doesn’t exist already, and there's already an incredible one here. Q. What do you hope to accomplish in your new role? My goal is to inspire a broad vision that builds on the collective strengths of UC Davis Health, the university, and relationships with external partners to achieve higher levels of excellence. Large systems like ours can make individual patient care more effective by developing innovative partnerships, applying advanced technology, and changing both the way we deliver care and even what we consider health care in the first place. We have all the parts here already. When we get them all working in synergy, we will lead the nation as an example of how academic medical centers remain not only relevant, but also serve as local and regional pillars of advanced care and wellness. For example, UC Davis can lead the effort to help raise awareness — and encourage innovative concrete measures, in concert with public agencies — to address social determinants of health. Especially in less-advantaged populations, access to these kinds of factors — healthy food, transportation, child care, clean housing, and a safe place for daily exercise — is thought to be twice as important to health outcomes and chronic disease management as the medicines we prescribe. Focusing on sicker patients as academic physicians do, our superb group of subspecialty clinicians can also take advantage of our longstanding leadership in telemedicine to serve patients who might prefer to receive more of their complex care in local hospitals. I heard many great ideas like these in my listening tours here, and I hope to harness them to catalyze innovation and better serve our patients, our local and statewide communities, and our academic mission. Personally, I love empowering teams that can develop novel solutions to difficult problems, and I love to serve on those types of teams. The ability to build greatness stems from a willingness to think broadly and propose ideas without fear. David has an impressive record of sound financial management and innovative practices for a high-functioning health care system that’s gained national attention. And his success in raising funds to meet pressing needs, including for enhanced access to Medicaid and indigent patients, aligns well with our values at UC Davis Health. Q. What role do you believe that higher education institutions will play in the future of health care? Academic medical centers (and supporting industries such as pharmaceutical and device manufacturers) have traditionally driven three of the four types of health research: basic science, its application to non-human models, and translation to human treatments. We now have a real opportunity to influence research in the fourth area — care delivery systems — with the same level of rigor. Organizations like ours are now seeing that it’s not only about having the right treatments, but also about applying brainpower to determine the most effective and least resource-intensive ways of delivering them. Medicine and public health, medicine and scope of practice, medicine and technology — the intersection of these areas, and how we get people the care they need, is an area of discovery that we can embrace right here. We can tap the expertise of our nursing school, medical school, clinics and public health team… experts from our veterinary medicine, agriculture, environmental science and engineering programs, through the innovative and collaborative “One Health” approach we use to improve the health of people, animals, and the environment… our informatics team and computer scientists on both campuses… and partners in government. Optimizing care delivery is something that I’m really passionate about. I believe that more immediate good will come from getting patients the care we already know they need, and that we can deliver, than from banking on the next great discovery. 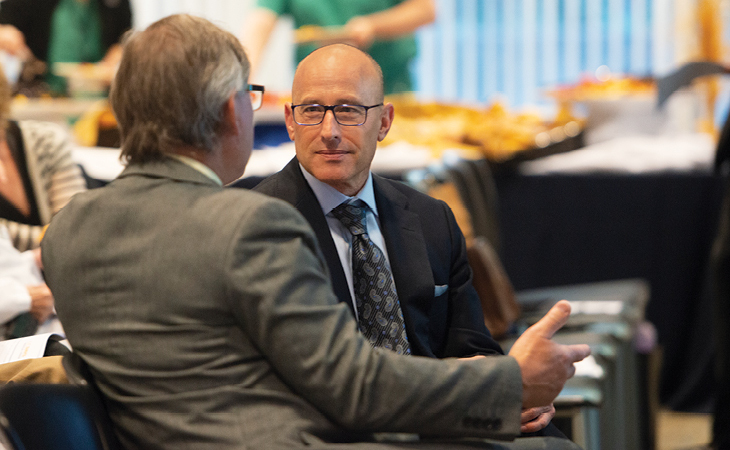 David Lubarsky, UC Davis Health’s new chief executive officer and vice chancellor of Human Health Sciences, began a listening tour upon his arrival this year. “With everyone’s help here, we can leverage change so that we’re serving ever-larger populations with the expertise and innovation we can bring to bear,” he said. Q. The health care sector remains an area of rapid change. How can UC Davis Health continue to adapt? Things are going to continue to evolve at a rapid pace, so we all have to be wise as we go forward and embrace the changes that are going to come. And I think there’s no one better to lead the way than a nationally ranked academic medical center like UC Davis Health. We’re already change leaders with a strong culture of innovation, discovery and knowledge-sharing. If we remain open-minded, we’ll continue to play a vital role in ensuring that today’s patients and future generations receive the highest-quality care they deserve. Embracing change can mean continuing to train future providers in new models of care delivery, for instance, or starting interprofessional learning and problem solving early to encourage team thinking. It can mean wrapping both social and behavioral health services into primary care medical homes. We are aggressively pursuing that through renewed partnerships. It can mean promoting wearable medical devices that allow for insights into chronic disease management, and using artificial intelligence machine learning linked to those devices to optimize medication dosing. It can mean harnessing precision medicine — pinpointing how best to influence each individual’s health, by analyzing both our individual genetic makeup and our individual expected responses to disease agents and treatments. These kinds of advances can reduce, or even eliminate, health disparities by promoting innovations in care quality, value, patient experience and public health. There’s a large swath of territory that needs an anchor academic institution in order to take care of the quaternary care that only we can do. But we’re also very careful and mindful that every organization needs to keep as much of its business as possible, as care continues to devolve to ever-lower sites of acuity. Q. At Miami you served most recently as chief medical and systems integration officer. Why is integration so important? Ensuring the team is integrated is always job number one for me. When physicians, nurses and administrators are all lined up behind quality care, and the inefficiency of siloed thinking is eliminated, there’s a natural motivation to do good for patients and do stronger work. As a professor of nursing for the last ten years or so, I am absolutely committed to the care team model. I believe that giving every single type of caregiver the opportunity to practice at the top of their license is not a threat. It’s my intention to choose leaders who are committed to that ideal. Integration is also important to value-based health, which itself is critical. All resources are finite, and we have an obligation to our society and our local community to spend those resources wisely so they have the greatest beneficial impact. Any “profits” delivered in our non-profit organization are simply more resources to pour into our mission of delivering high-quality, complex care that others cannot, and into producing high-quality nursing and medical students and trainees to care for us and our children into the future. Q. How else do you see UC Davis Health adapting? We have to continue partnering and building local care facilities so that people can get care close to home, and then come to the urban-core facility for specialty care when they need it. Our future planning will emphasize this heavily, because it helps support our academic missions in the current marketplace and can also enhance provision of services for underserved populations. Our Community Health Needs Assessment tells us we must deliver services how, where and when patients want them — in their neighborhoods. For underserved populations, partnering with federally qualified health centers will remain important — they’re positioned to provide efficient, localized care. Since I’ve been here, I’ve been learning about the opportunities to expand our commitment to the uninsured and to Medi-Cal patients, and to make sure we’re fully accessing all of the available state and federal funding support for this vital social mission. This was also a focus in my last position at Miami, which is home to the nation’s largest safety-net hospital, Jackson Memorial. 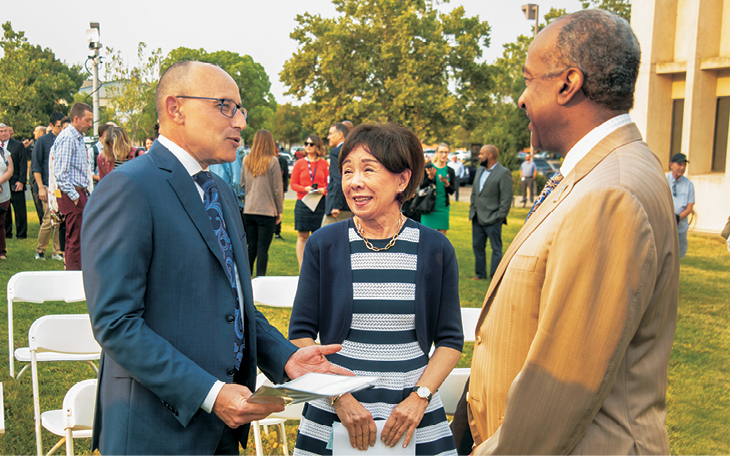 David Lubarsky, Rep. Doris Matsui and UC Davis Chancellor Gary S. May at an August event announcing the UC Davis Rehabilitation Hospital, a second hospital planned at UC Davis Health. The public-private venture will be part of Aggie Square, UC Davis’ recently announced technology and innovation hub just south of UC Davis Medical Center. Q. What would you like to tell our referring physicians and community partners? Partnership, collaboration and collegiality will drive our relationships with all of the health care organizations serving the Northern and Central California regions. There’s a large swath of territory that needs an anchor academic institution in order to take care of the quaternary care that only we can do. But we’re also very careful and mindful that every organization needs to keep as much of its business as possible, as care continues to devolve to ever-lower sites of acuity. So we need to partner with all of the organizations out there to help them achieve their missions and visions to serve their communities. We’re a growing population and a growing area, and there’s more than enough work for everybody to do in health care. If we all work together, we’ll have a truly healthier Northern California population. On a very tactical operational note, we do know that we must improve our patient appointment wait times. This means increasing access at more convenient times and places. In parallel, we need an easier process to get through our emergency department for care, and to accommodate transfers to our hospital. We know this is hard work, but well-developed solutions exist. One point was clear during my recruitment: the Sacramento region is a growing hub of innovation, from health to tech to agriculture. I’ve noticed that both the UC Davis campus and UC Davis Health have strong connections with local communities, business leaders, and elected officials. I’m learning more about the region’s successes and challenges, with an eye toward how we can build meaningful partnerships to improve health and well-being for all residents in Northern California. 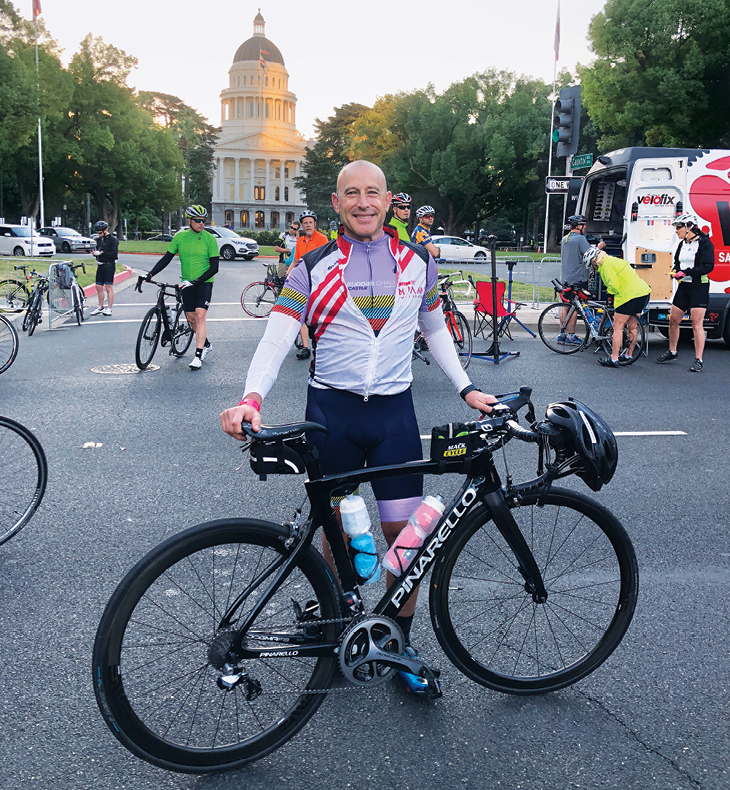 David Lubarsky during a cycling stop at California’s state Capitol building. Lubarsky is an avid cyclist and sprint triathlete, and founded what is now the nation’s oldest college ballroom dancing club while studying at Washington University.